Welcome to the Emily's House page on Natalie Wright, Author. 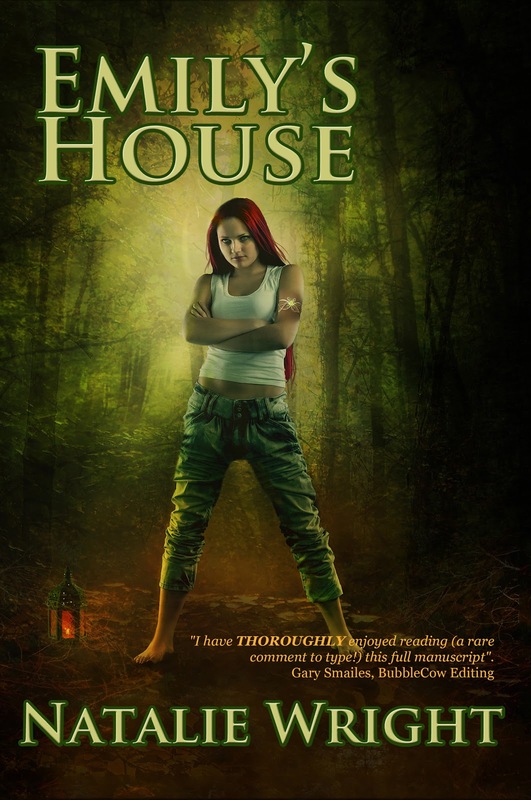 Emily's House is Book 1 of The Akasha Chronicles series. If you love stories about characters with magical powers, this book is for you. 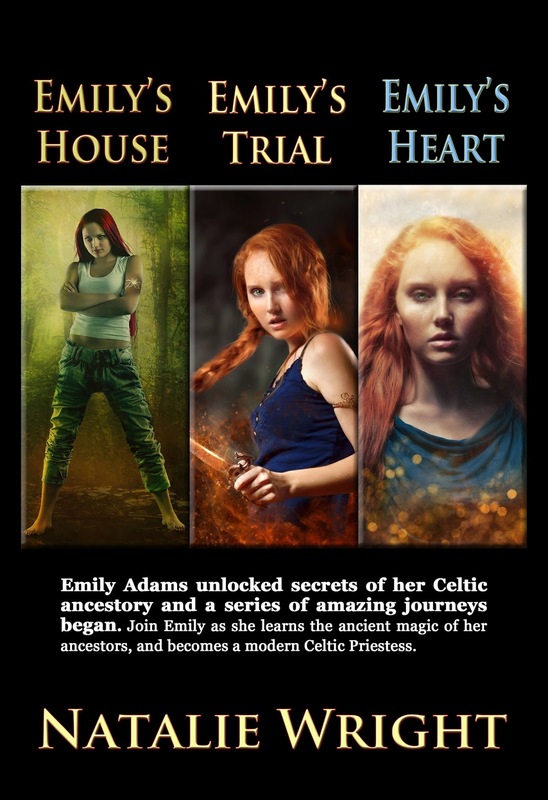 If you are intrigued by stories with a Celtic twist, this book is for you. If you enjoy a good hero quest story, this book is for you. And if you like action and adventure, this book is for you! 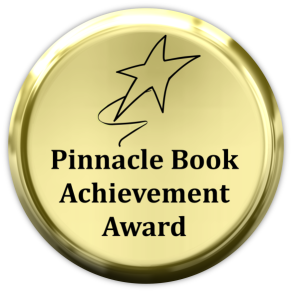 Emily's House has received the Pinnacle Book Achievement Award for excellence in independent publishing in juvenile fiction AND the Reader's Favorite 5 Star rating award! With her two best friends by her side and her mother’s memory in her heart, a teenager undertakes a journey to save the world from an ancient evil. Emily Adams has always known she’s special. Throughout her whole life she’s had visions of things that haven’t happened yet and she could always read her mother’s mind. At least, she could until her mother died. Emily thinks her abilities are just about gone, but the arrival of a strange creature in her backyard one night proves otherwise. Emily discovers she is the last of the Order of Brighid, an ancient society of women sworn to protect the portal to the Netherworld. Now, with the portal under attack, it’s up to Emily and her two loyal, wisecracking friends to stop a villainous man before his actions destroy the world. Links for iTunes and for International Below! With her two best friends by her side, Emily risks everything and embarks on a dangerous journey to Ireland and beyond. As the hour of world annihilation draws near, the fate of her friends, her family and her world lies in her hands. A Wattpad reader said: "You are an amazing writer! If it was a hard copy I would have said that I didn't put it down until I had read the entire thing ... not quite true, I read it on a flight from NYC to Mumbai. Please keep up the excellent work; the world needs more of that creativity and positive outlook." "There's also another dimension created in this book and it's not exactly what I expected it to be. When I hear "another dimension" I tend to think robots, aliens, everything is upside down- I don't know. This was basically whatever you wanted it to be. There were some really cool thoughts expressed through the characters- and let me say it was refreshing to see some characters who weren't dim witted. I wouldn't hesitate to tell anyone to read this book!" Copyright © 2011, 2013 by Natalie Wright. All rights reserved. The whoosh, whoosh, whoosh of that infernal machine. Its bellows pump up and down as black, tarry sludge is sucked up the tube and into the holding tank. She lies on the bed like a robot corpse, tubes and lines going in and out of her body. Her once rosy lips are pale, tinged slightly green. Her once vibrant emerald green eyes are closed, sunken into the eye sockets. Her once strong body lies still and shrunken. Only her hair looks the same, flowing like a red wave across the white shore of the pillow. I stand at the door and gingerly peek in. I don’t want to be there. I don’t want to see her like that. I don’t want the putrid odor of dying people stuck in my nostrils. I don’t want to go in, but I’m sucked into the room anyway. My legs feel powerless against the invisible force that draws me in. I flail my arms and try to command my body to obey me and run from the horrid scene. But I’m in the room anyway, drawing ever closer to the bed. What is that tarry black stuff? Is it being sucked out of her body? Or put in? I’m close enough to touch her, but I don’t want to. The last time I touched her I saw a vision of her taking her last breath. The last time I touched her, I saw her die. I don’t want that to come true. And I don’t want to see her die again. The first time I saw her die I ran and ran, trying to escape the vision. I don’t want to touch anyone ever again. My hand quivers as it reaches in slow motion toward the sleeping body that bears a resemblance to my mother. Is she still in there? Or has the cancer stolen the last of her? My fingertips shake as they touch her hand. The skin on her hand is as thin as an onionskin and shows the blue-red blood vessels beneath. As soon as my fingers touch her hand, her eyes pop open in a look of terror. Her mouth is open in a scream. But it’s not a human scream. It’s the loud whoosh, whoosh, whoosh of that tar-sucking machine. She sits up. The long, wavy red hair flying about her head is the same, but the face is no longer my mother. It looks at me with large, solid black eyes, devoid of light or emotion, staring out of a bare skull. Her hand is no longer covered in thin flesh but is instead the hand of a skeleton. The hand of bones grips me hard. I pull and pull to get free of the monster, but it has me. I’m caught in its grip. I finally wake, dripping in sweat. My mouth is still open in an “O,” the scream still caught in my throat. I awake once again from the same ghastly dream I’ve had for the last seven years, only to find myself in a house of nightmares. "The vast border betwixt a contemporary American Southwest and an ancient, Celtic Ireland is as foggy and hazy as a seaside, Sligo morning; yet this chasm is bridged brilliantly and smoothly enough to ease the reader hither and thither, back and forth, between said realms. 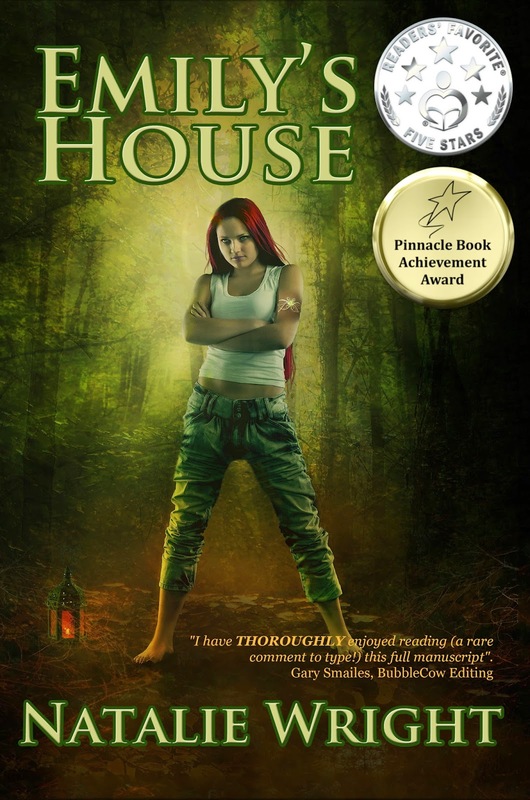 Natalie Wright has divined in Emily's House a simultaneous modern and ancient fairy tale of the greatest kind: sans parents, sans immediate consequence, sans cowardice. Bravery is said to be not the lack of fear, but action in the face of it. Like the best of Grimm, Perrault and Charles Schulz, Ms. Wright's kids find themselves amidst adventure, terror and turmoil, as well as ineffective and/or absent parental units. By their own bootstraps they must find their way home, to save not only each other, but perchance an entire civilization. "Adults drool, kids rule" is the motto for any well-written young adult or children's tale. Natalie's kids indeed rule. This one will last, alongside Grimm, Perrault and Schulz, in the coffers of timeless, fantasy literature. Plus, there's Hindergog and no one could not love Hindergog! Well done, Ms. Wright. Well done, indeed." "Absolutely captivating! As a gal who resides in Ireland I always find it interesting to read works with Celtic references. I read the description and was intrigued, I then went on to read the first page and what can I say I am hooked. The descriptive skills of this woman surpass many I have come across. Considering how many books I have read (I think it;s over 2k now) I have to say this book is superb! Just read the first page (click below the pic to "read ebook") and I dare say you will not be able to stop turning the pages so to speak. The plot is robust and delightful. I recommend this book whole heartedly!" NatWritesYA (AT) gmail (DOT) com.